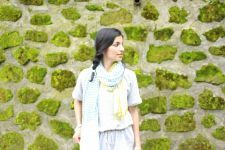 HolisticOT.org is a community of occupational therapists that incorporate complementary and integrative health, wellness, and prevention into their practice. In our Meet a HOT (Holistic OT) Community Practitioner series, we learn about how our full members integrate mind, body, spirit medicine, prevention, and wellness into their practice. Join us as we learn more about this month’s featured practitioner. Karla is a holistic occupational therapy practitioner who specializes in women’s health in McAllen, Texas. Karla strives to take an “upstream” approach to treatment, addressing the cause of illness through healthy habits, nutrition, and mindfulness practices. She has been practicing just over two years, and in addition to working in outpatient pediatrics, she heads her own private practice, Feminae. Feminae is a unique women’s health practice bringing holistic services to support, enhance, and/or aid in the recovery of health in women in the prenatal and postnatal stages addressing issues such as pelvic floor and core health, stress/anxiety, sexuality, pain, mindful movement, and more. 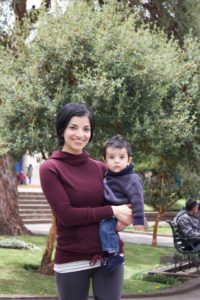 Karla utilizes her health coach certification to complement her treatment by offering guidance for healing nutrition, and she also supports the whole family adjust into new roles and responsibilities that come with parenthood. 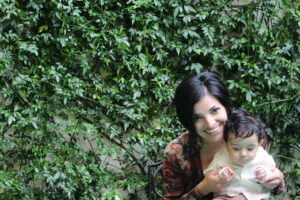 She addresses fertility issues, overcoming grief related to miscarriages, and supports healthy pregnancies. 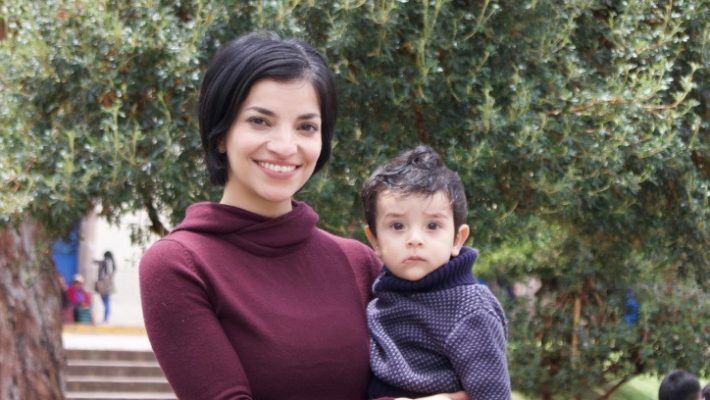 Karla was inspired to serve other women by her own pregnancy and childbirth experience, and she uses holistic and complementary approaches in her treatment as well as her own life. She practices yoga, meditation, boxing, and intense varied functional exercise. She loves to travel and finds joy in sharing moments with her family. Karla is from Mexico and moved to the United States as a child. She is bilingual in English and Spanish, and practices French for love of the language. Karla inspires others to take charge of their health by awakening their consciousness and finding joy in the now. 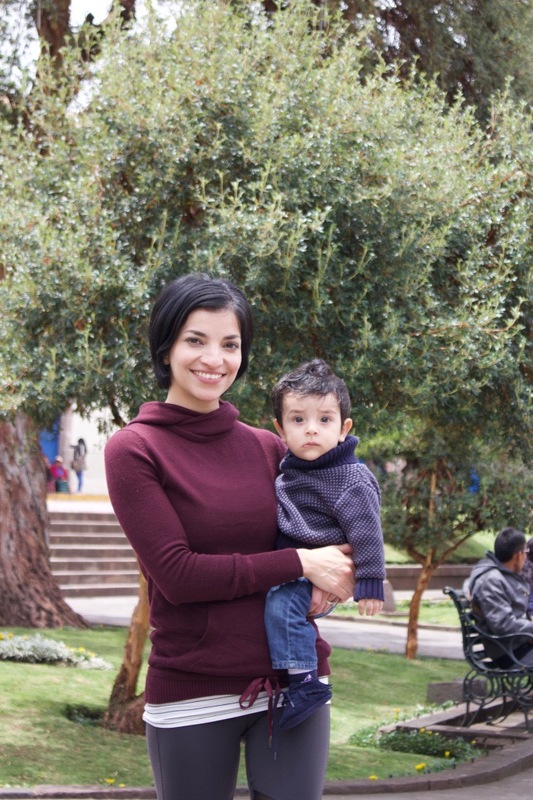 We are privileged to count Karla as a member of the Holistic OT community—let’s get to know her! 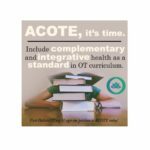 At what point did you incorporate complementary and integrative health into your OT practice? Since going into OT school I knew I wanted to incorporate complementary and integrative health in my practice. I faced challenges when my first job didn’t exactly provide opportunities for this. However, after taking a couple of Holistic OT courses by Emmy Vadnais, OTR/L, doing some soul searching and introspection, I decided I could incorporate this approach in the pediatric setting I work in, and I figured out a way to do it. Later on I was inspired by my pregnancy and childbirth experiences to work with women, to provide the support that is lacking for our mental, emotional, and physical wellbeing and recovery around this stage of life. This is what led me to open a private practice in women’s health. Here is where I completely and harmoniously incorporate complementary and integrative health, and it’s lovely! Which complementary and integrative health approaches do you use in your practice? 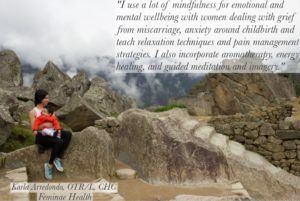 I use a lot of mindfulness for emotional and mental wellbeing with women dealing with grief from miscarriage, anxiety around childbirth and teach relaxation techniques and pain management strategies. I also incorporate aromatherapy, energy healing, and guided meditation and imagery. How do complementary and integrative health approaches uniquely benefit your clients? Emotional and mental health are areas commonly affected around the pregnancy journey. Usually, women are given medical prescriptions and/or interventions aimed at covering symptoms, or these areas are not addressed at all. 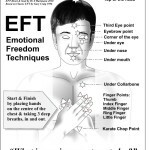 By addressing the mind-body-spirit using a holistic OT approach, we (the client and I) are able to help her be in a better emotional and mental state, which is where healing begins! Increased positive energy, optimism, improved outlook, increased motivation are the perfect primers to work towards other goals. As a certified health coach, I also address nutrition to support healing and improved health. What advice can you offer to occupational therapists looking to incorporate complementary and integrative health care into their practice? My advice is, if this is calling to you, if you feel curious or already know you want to make this part of your practice, keep searching, keep asking the universe for guidance, take courses that catch your curiosity. Hold on to the frequency and trust that if it feels right and inspiring, you are on the right path. Certain settings and especially insurance companies make it difficult to incorporate this work into our practice, but there is always a way or a wording around it. The mutual benefit (client-therapist) from using complementary and integrative health is beautiful. Please describe a moment or situation that affirmed your decision to practice OT with complementary and integrative health. When I was completing my first evaluation from a women’s health client, I felt so at ease. Not a drop of nervousness, not a doubt in my head. It was one of those moments that feels so right and natural, you almost feel in a state of levitation! It was a confirmation that my experiences, approach, philosophy, and energy were in line with the specialty I have chosen and the clients I wish to serve. What do you see in the future for OT with complementary and integrative health and the Holistic OT community? 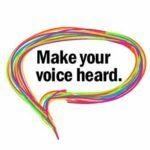 I believe the advocacy and support the Holistic OT community provides will inspire and empower other OTs who wish to incorporate these practices. I wouldn’t expect ALL OTs to want to do this as I believe everyone benefits from different approaches, experiences, and points of view, but those who are interested have great resources here and in the Holistic OT community group. What is your favorite thing about being a full member of the Holistic OT Community? I appreciate being part of the leader’s group and having a voice for the direction and goals of the Holistic OT community. To learn more about Karla Arredondo’ services, please visit her Facebook page. To view her contact information, please visit our holistic practitioner directory.